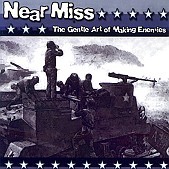 Featuring members of Big Wig, Near Miss' The Gentle Art of Making Enemies is quite predictable. Clean cut, but still retaining a bit of a snarl vocals, pounding rhythms, and non-offensive, fast, loud guitars. Your standard pop-punk formula. But, much like Big Wig, Near Miss does it so fast and melodic, you find yourself singing along and nodding your head in approval before you notice the generic-ness of the sound. I'll give it a C+.